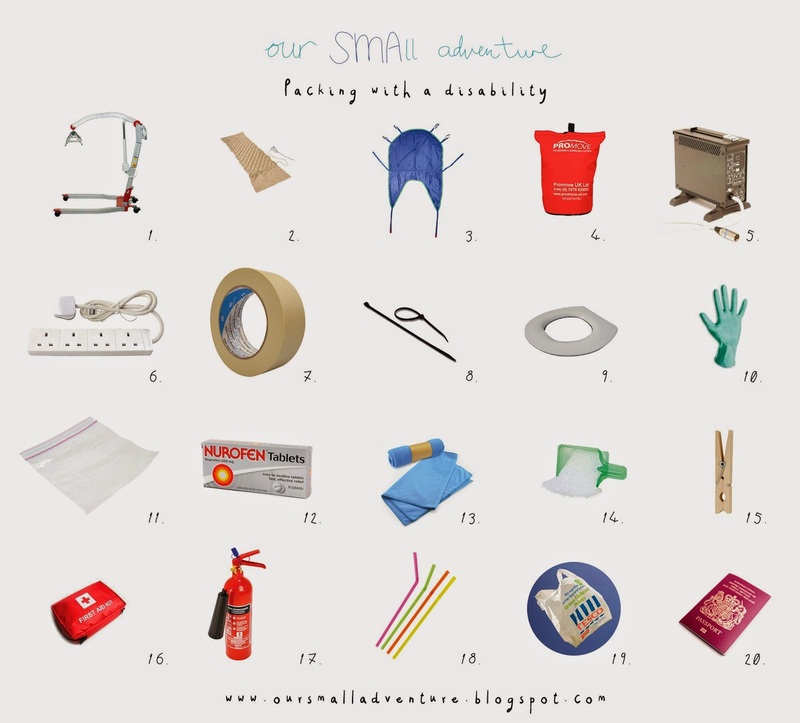 With only 7 days to go, I thought I'd put together my tips to packing with a disability. I've skipped the usual things like clothing, wash kits and suncream, this is the comprehensive guide to packing disability equipment. As you can read in my previous post, I'll be taking a Molift Smart hoist with me for transferring from bed to chair etc. Of course, you'll need all the extras such as the battery charger and batteries, of which I'm taking two. You might also consider taking bed raisers as mentioned in my post, to coincide with trouble free hoisting. Mine is the Invacare Alternating Pressure Pad, which is very transportable and easy for packing. Its so lightweight and small that the pad itself can fold into a shoe box! It isn't as supportive as other pressure airflow mattresses but its definitely enough for me and takes minutes to set up. It's a great option for travelling light as standard pressure mattresses can be so bulky to transport. You should also consider all of your sleeping needs, from memory foam pillows and slide sheets - why not roll all into one and transport it in one piece? I'll be taking 3 slings with me during my travels, as I don't know for sure when I'll have time to dry them completely. You might want to consider strapping one to your mobile hoist with bungee cords so that it's always accessible, and you won't have to dig around in your luggage for a dry one. Consider your safety. Personally, I've been in two hotel fires and neither were equipment to get me out safely. Some hotels do keep transfer slings in stairwells but why take the risk? A transfer sling can be used to lift a client without the use of a hoist, just two to four people taking each grab handle, leaving the client fully supported and safer for the lifters backs. When we are staying in the hotel for just one night, arriving late and leaving early, we may very well use the ProMove transfer sling instead of taking the hoist. Be vigilant in checking the power of your charger so that you buy the suitable adapter for foreign plug sockets and wattage. The last thing you need is for your charger to start smoking, or to not give your chair a sufficient charge! Follow on from number 5, hotels rarely have the amount of plug sockets that a disabled person requires, so be prepared and take your own multi plug. For a mattress, wheelchair charger, hoist charger and a spare one for a phone charger, a 4 way plug is totally sufficient and doesn't take up too much space, but gives you much more freedom. Again, consider your safety. With cables everywhere, why not tape them to the carpet to stop anyone tripping over them, or getting caught in your mobile hoist wheels? Masking tape is cheap and not so sticky so its easy to peel away. These come in handy for so many different reasons, but we take them just incase something breaks on my wheelchair or any other equipment we can fix with a zip tie. They can also be used for keeping bulging luggage zips together, or some nasty cables out of the way. Being so tiny they can be stored anywhere, a good all rounder. Of course, carrying a small toolkit is vital! Where you're catheterised or not, take a moment to go through your routine and see what you need. Make yourself comfortable, take as much as you need. I don't take a commode chair with me even though I use one at home, mainly due to lack of space. Instead, I hoist over the toilet and can balance on a children's padded seat cushion with the weight held by the sling - its a simple process but is sometimes overlooked, when we have more complex equipment in our homes, so this technique may work for some of you. Aways be prepared. Even if your PA's don't usually wear them when helping with personal care, I'd advise taking a pack of clinical gloves just incase. Some toilets you visit may not be as clean and tidy as you had hoped, so whack on some gloves and get it over with as quickly as possible! Antibacterial hand gel, is of course a no brainer. Who'd have thought I'd be packing these guys? But seriously, these things are so versatile and awesome, I wouldn't go on holiday without them! I use them for a range of things, from storing wet face clothes (nobody likes a damp wash bag), keeping medication together and perfectly dry, storing dirty items of clothing so they don't sit with the clean bits in your luggage (we all have ice cream accidents right, or is it just me? ), to of course, storing sandwiches. Go through an average days medication, and pack accordingly. THEN pack for a bad day. You can never be too prepared when it comes to what to take, because nobody wants to sit in pain during a holiday. I usually take enough for 3 bad days, any longer and I'd seek medical attention. I'll be taking a dry prescription of antibiotics with me so that I feel a cold brewing I can nip it in the bud and start it immediately, just add water. Sounds an odd one, but these things are great. They're very lightweight so they are easy to pack into small spaces, but their micro fibre material dries you extremely quickly, and then itself dries quickly too. I'd also recommend to use it as an extra blanket too if feeling a little cold. Taking a tupperwear box of laundry power means that you can wash a few bits and pieces in your hotel sink and hang them to dry overnight. It's also great for freshening up slings if they start to smell a little damp from being wet and not having sufficient time to dry them. Of course, perfect for helping with the laundry bits but also great for clipping paper and other things together. You only need a few. These are so inexpensive to pick up that you'd be silly not to. Save yourself the aggro of finding a pharmacy in a foreign land and take a simple kit with you. If you're employing your own PA, by law you need to have this anyway. This is required in almost all European countries to have in your car at all times as part of Continental European Driving Laws, but taking one may give you some peace of mind in some hotels. If you use them, take them. You'd be surprised as to how many restaurants don't stock them, or don't know the word 'straw' (you can see my translation sheet for some language tips), so just stick some in your luggage just in case. I carry individually wrapped ones in my handbag from Subway, but taking a few more can't hurt. Who doesn't have 6 thousand of these guys floating around their house? Stuff a few in the outer pockets of your luggage for easy retrieval, you'll be thankful that you did and surprised by just how useful they are. Similar to the Ziploc food bags, these can be great for storing bigger wet items in your luggage to keep everything else dry, slings, towels, clothing, shoes, you name it. Also great for discretely disposing of used medical equipment such as clinical gloves or wipes. Triple check passport dates, flight tickets, travel insurance, PA contracts and get packing! I'd really like to encourage other disabled travellers to comment on this post and add other things that they find essential for taking on holiday with them! We're all different, and these are just my top tips of what I'll be taking with me for Our SMAll Adventure. I also take my cough assist and bi-pap just in case! Oh and my push wheelchair in case the dreaded break down happens! I also take a inflatable camping mattress instead of my alternating air mattress and a bed wedge to elevate the head of the bed. It's been mentioned by other disabled travellers to take a spare wheelchair charger, a miniature tool kit, a travel kettle and miniature hot water bottle, and of course copious amounts of teabags! My partner stumbled across your page while searching the net, she showed me because it is very similar to a trip I did with a couple of mates back in 2010. I'm paraplegic so did not require as much equipment and such a heavily modified vehicle.But when it comes to access, being in a wheelchair is pretty much the same regardless. Funny thing is my partner and I are back in the UK and just about to embark on an even more ambitious trip. We are planning on driving our modified 4x4 from London to Cape Town, but rather than heading dead South we are going East through Central Asia first. We've spent over a year planning and are getting ready to finally leave some time late this month. Great to hear you found us through searching the web, this is exactly what I wanted to hear! Glad we're able to reach you. Would love to say that wheelchairs are comparable but unfortunately not, we're specifically doing this trip in an electric wheelchair as these are no where near as adaptable and easy as a manual chair that you may use, they can't be stowed, lifted up a few steps nor bumped up a few. This dead weight is heavy, even if I'm not!